The B06 Navy Mercer Island team got a huge result over the weekend as they topped MVP Rapids 1-0 down in Ravensdale. These two teams have competed against each other several times over the last year and these games are always intense and entertaining. This time around, the game was fiercely competitive as both teams played very hard and physical. The Titans got a quick lead as one of the team’s shortest players, Lucas Shelton, got his head on a ball from a corner and took the early lead. After they converted the goal scoring opportunity, the boys stepped their game up and defended well. The boys have one of the best defensive records in the state and this was arguably their best performance to date. The boys bunkered down and kept the Rapids attack at bay. Coach Jack was very proud of their performance and the boys will look to continue their good form this upcoming weekend. The G06 Navy Bellevue team competed against MVP Marauders and drew 0-0 at Chinook Middle School. Coach Gabe was over the moon with the team’s performance. Gabe believed that this was the best team performance from the ladies up to date. The girls played the game well combining with each other all over the pitch, playing out of the back, and making big plays in crucial moments. Very proud of the G06s and hopefully they will take this excellent form into training this week and continue to improve and build on their performance. The B06 Navy Bellevue squad took care of business over the weekend with a big 3-0 result over ISC Gunners. The team controlled and bossed the game from start to finish. Coach Javi was pleased with the team’s masterclass performance. The boys possessed the ball all over the pitch, played out of the back with confidence, and switched the play with ease. Georgie, Kaliyan, and Kousei all got on the scoresheet on their way to victory. Very proud of Coach Javi and the team with their performance. Coach Nelson and the G02 White Bellevue squad came away with a solid 4-0 victory over TC United at Robinswood Park. It was a highly competitive and physical match, but the girls were disciplined and focused on the game. The girls have been working on switching the field of play and connecting through the midfield in training and it showed in their game performance. The girls had 4 great team goals and goalkeeper Sophie Sharp played extremely well in the back to keep the clean sheet. Well done to Coach Nelson and the ladies for their excellent result. B05 Navy Mercer Island lost a tight match against FC Bellevue at Newport Hills Park. The boys pressed the opposition high up the field and got in some dangerous areas of the pitch. The boys poured on the pressure and kept the opponents on the back foot but couldn’t quite put away their chances. Coach Keegan was pleased with the intensity the boys played with and hopes that this result will ultimately bring out the best in them in this week’s training and in next weekend’s action. The B07 Navy Bellevue team lost 4-2 to Nortac Sparta at Baltimore park. The team started off slow and conceded 4 goals in the first half. It was a big hole to climb out of, but the boys weren’t discouraged. The boys came out in the second half firing and grabbed two goals back. However, it was a little too late for the boys and they couldn’t quite make the comeback happen. The second half was great from the team, but Coach Keenan and the squad will look to put in a complete performance next weekend. B08 Navy Bellevue couldn’t quite get a result over the weekend. The boys fell short to a decent MVP team in Ravensdale. Coach Gabe said the team played too compact and didn’t quite maximize the space on the field. The team will look to improve on their shape in training and rebound after their team performance. This team has a ton of potential and they will be determined to get a better result next weekend. 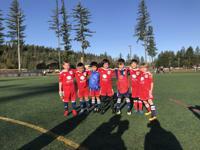 The B09 Navy Mercer Island team had two games over the weekend! In their first match, the team was unstoppable. The boys climbed to a big lead early, capitalizing on some great individual runs up the field. In the second half, the boys played even better as they moved the ball all around the pitch, switching the field of play and playing selfless soccer. In the second match the following the day, the boys didn’t quite play as well as the day before and fell short to the opposition. The players were a little tired from the previous match and also had a hard time adjusting to the sunshine. It was a learning experience for Coach Keegan and the team and they will look to get a better result next match! B06 White Bellevue and B06 White Mercer Island faced off in another Titans FC Derby Match. The game was filled with a ton of action, but ultimately, Coach Nelson and the B06 White Bellevue squad came out on top with the victory. Coach Nelson’s team sits on top of the table, winning all 5 of their games in great fashion. Coach Javi and the boys are also playing well as they develop the principles of play, building out of the back, and possessing the ball with a purpose. Both teams played great and we are glad these two teams are able to step on the pitch together and compete. The B05 Navy Bellevue squad put in an absolute masterclass performance over the weekend. The boys came out on top 2-0, but their dominating presence on the field stood out more than anything. The boys were playing complete soccer, moving the ball around the pitch, switching the field of play, and playing with a tremendous amount of confidence as players were fearless in the attack. The boys played on a whole other level and the result was never in doubt. Great stuff from the boys. The G04 Navy Bellevue team took down a solid FC Bellevue team 2-0 at Newport Hills Park. The ladies played great and was almost a copy of last week’s performance. Last week, Valentina scored a world class volley from about 35 yards out. Incredible goal! However, this past weekend, she decided to one-up herself and score similar volley…from 40 yards out!!! Amazing stuff! The team played well as a unit and defensively, the girls were unbeatable. Great stuff coming from our G04 team over the past couple of weekends and we hope the girls will continue their good form. The B08 White Bellevue team almost got a result but couldn’t quite find the back of the net to keep them in the game. The boys played with a tremendous amount of energy and never gave up. There is no quit in this team and it shows in the way they compete. The boys challenge for every ball, continue to stay focused on the game, and help support each other during their trainings and games. Very proud of this team and their continued development. The B04 Navy squad suffered their first loss of the season 2-0 against the Gunners. Tough result from the squad as they dug themselves a hole early conceding two goals in the first half. The boys played much better in the second half as they created several opportunities to score, but the boys didn’t quite have enough composure in front of goal to climb back in the game. Despite the loss, the boys still sit on top of the table. The boys have a huge game next weekend as they compete against 2nd place Aguilas. 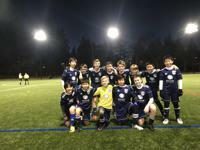 The B07 White Bellevue squad had two games over the weekend and split their results. In their first match, the boys didn’t quite have enough energy to come away with the victory. In the second match, the boys lit up the scoreboard and came away with a 8-0 victory against a good Celtic team. The boys had a setback on Saturday, but that didn’t stop the team from bouncing back and getting a result the following day. Great stuff from the boys! 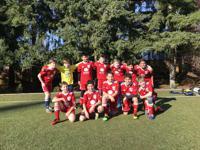 The B04 White Bellevue team competed against Dragon’s FC at Chinook Middle School and lost a tight matchup 1-0. The team played well but couldn’t quite find the back of the net to get on the scoresheet. Tye was pleased with the way the team competed and the discipline the boys showed on the field. These players continue to get better and develop their craft, regardless of the score line. We are proud of this unit and their continued improvement. Well done boys! The B08 Navy Mercer Island team lost a tight matchup to Emerald City as they fell short 4-3 at Starfire. The boys came out firing as they put away three goals in the first half. These players have the ability to catch fire and pull away early in games. However, the second half was a different game. The boys didn’t have any subs and began to run out of energy. The opposition were able to come back and put away a goal near the end of the match to go ahead. Very tough loss for the boys, but certainly a learning experience for the boys. Coach Tye and the players will look to put together a complete performance in their next matchup this weekend. To round out the Titans FC Weekend Review, the G01 Navy Team put in a strong performance against ISC Gunners and came away with a 2-1 result at Robinswood park. Coach Adam said that the two goals scored by the girls were two of the best goals he has seen in youth soccer this season. The first goal was a tremendous team goal with some great combinations which lead up to an easy tap-in from Madison Rizer. A Barcelona-esque goal to say the least. The second goal came from the magician Bri who carried the ball from inside her own half, dribbled past several defenders on her way to goal, and slotted the ball past the goalkeeper with composer and ease. The girls conceded a goal late, but it was too little, too late for the opposition. The girls completed the double over ISC in the NPL season. The girls currently sit in third place in the NPL! Great stuff from Coach Adam and the ladies this weekend!